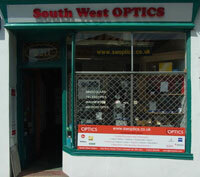 "Welcome to South West Optics"
I set up South West Optics in Truro in 1996 as a retailer of high quality optical equipment. My main interest is birding, a hobby which I have been involved in since boyhood. Recent improvements in Digital SLR technology has meant that I have spent time photographing birds in Cornwall and abroad with my Nikon D3x and 600mm F4 lens, some results of which are posted on the swopticsphoto blog. Needless to say, the shop specialises in supplying optics and camera equipment to the birding market and other related outdoor products. As a user of the equipment, I offer knowledgeable product advice to suit your requirements. South West OPTICS are officially appointed Main Dealers for Leica, Carl Zeiss, Swarovski, Nikon and Opticron. We also stock a full range of low-vision aids (magnifiers), nature cameras, Manfrotto and Velbon tripods. We also stock Leica and Nikon digital cameras and can offer advice when using them for the growing Digiscoping hobby. Our shop is sited within Truro city centre where most of our products are on display. We hold occasional stock demo days in the field, though there is a long distance view at the shop. Further critical testing can be done at parkland just behind the shop. If you are travelling specially to purchase or test a product, please call beforehand to confirm availability. We endeavour to offer you the best service, competitive prices and best web experience that we can.